The Stylist Den: Jackie Kennedy and the 'fake' Chanel suit. Just a quick detail/curiosity that I'm reporting after haveing read the news both on Styleite and Fashionista. 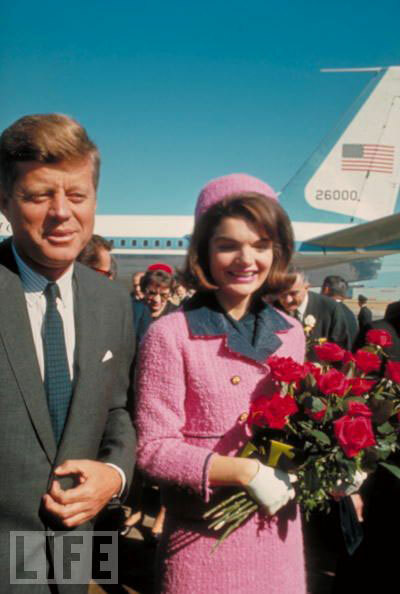 It's about the pink Chanel suit that Jackied Kennedy wore on November 22 1963, the day of her husband assassination. From the interview by Tim Blanks to Carine Roitfeld and Karl Lagarfeld emerges that suit was a 'fake' or, as Lagarfeld explained, a line-by-line copy of it. That means that the fabric, trims and button were original Chanel, from Paris, but shipped to New York, cut and fitted there because Jackie wanted to avoid anymore bad press for her spending habits, and have a suit made in America. Fashionista.com question the definition of 'fake', because all the pieces to make the garments were original but in my opinion in this case, as Lagarfeld says, the suit cannot be labelled as Chanel as it lacks the made in Paris touch to it that makes it 100% original. Un dettaglio/curiosita' veloce che riprendo dopo averlo letto sia su Styleite che Fashionista. Riguarda il completo rosa di Chanel che Jackie Kennedy indosso' il 22 novembre 1963, il giorno dell'omidio del marito. Dall'intervista di Tim Blanks a Carine Roitfeld e Karl Lagarfeld emerge che il completo e' 'un falso' o, come Lagarfeld spiega, una copia passo-passo. Significa che il tessuto, gli abbellimenti ed i bootoni sono originali Chanel, di Parigi, ma spediti a New York e tagliati e cuciti li' poiche' Jackie avrebbe voluto evitare altra cattiva stampa riguardo le sue spese esagerate ed avere un completo made in America. Fashionista.com mette in discussione la definizione di 'fake', poiche' tutte le parti per cnfezionare il capo erano originali ma secondo me in questo caso, come afferma Lagarfel, il completo non si puo' definire uno Chanel poiche' manca della manifattura a Parigi che lo renderebbe origianle al 100%. I totally agree with you! The fact that a suit is made of parts of an original, but it's not made in the original country makes the suit a mere copy.